The story of this magnificent bronze statue, which was discovered in 1996 on the seabed in the Lošinj archipelago, could be entitled ‘In Search of Apoxyomenos’. Not only is it the story of finding the statue in the sea, the long process of restoring it and displaying it in many towns, but it is also the story of the fantastic Museum of Apoxyomenos in Mali Lošinj. The Apoxyomenos Museum in Mali Lošinj was opened exactly twenty years after Apoxyomenos was discovered on the seabed. The opening of the new museum attracted great interest from the public, visitors, the local community, and art lovers. This valuable Greek statue from the 2nd or 1st century BC is a true sensation. Not only is it a well-preserved archaeological find, but it is also a fascinating work of art. Apoxyomenos was a frequent motif in Greek art. It celebrates the beauty of the human body, sport and power at the moment when a young athlete scrapes the sweat and dust from his body after competition. The calmness of the moment after competition and the almost meditative state of the athlete creates a contemplative and sublime feeling in the observer. Out of a total of eight preserved ancient statues with this motif, the Lošinj one is the most well-preserved. When the Belgian diver and photographer René Wouters went diving back in 1996, he could never have known that he was about to find a valuable ancient statue that was thousands of years old. At a depth of 45 metres, close to the small island of Vele Orjule, he discovered a world archaeological sensation. Underwater archaeologists did not bring Apoxyomenos to the surface until 27 April 1999, after which the statue was desalinised for a year. The six-year-long careful restoration by Italian and Croatian experts started with X-raying every part of the statue, which was entirely preserved except for a little finger. The restoration process took years to complete and involved hard work and the almost exclusive use of hand tools. In 2006, the statue, reinforced with an internal supporting structure, was ready to be displayed in public. Apoxyomenos was first presented to the public in the Archaeology Museum in Zagreb, after which it travelled around the world to satisfy the curiosity of numerous lovers of culture and beauty. Underwater archaeological sites are usually shipwrecks loaded with cargo that tell the story of the lives of our ancestors. Storms at sea, battles and defects in ships are the most frequent causes for ship sinking. However, Apoxyomenos was found alone, and there is no trace of a ship or any other item that might have been carried with it. Why did Apoxyomenos end up in the sea? Experts assume that a violent storm made the crew discharge their cargo. Or maybe the statue was thrown into the sea as an offering to the gods? Inside the statue, the nest of a small rodent, and some seeds and twigs were found, which means that at the moment of its transportation Apoxyomenos was already old, as it must had been displayed somewhere long enough to become home to living creatures. We don’t know exactly how old the statue was when it began its journey, which turned out to be an odyssey that would last thousands of years and end happily in a museum in Mali Lošinj. Where was the ship sailing and why was the statue thrown overboard? Perhaps we’ll never know. The Museum of Apoxyomenos is dedicated to one exhibit only, which makes it unique in the world. Experts could not agree about the future home of Apoxyomenos. Some of them suggested that Apoxyomenos should become part of a collection of an existing museum in Croatia. However, the view that prevailed was that Apoxyomenos should receive its own museum on the island of Lošinj. Years of planning and construction work resulted in an architectural spectacle. The museum is located in the magnificent Kvarner Palace on Mali Lošinj waterfront. The architects preserved only the front façade of the palace, while the museum itself is actually a building inside a building. 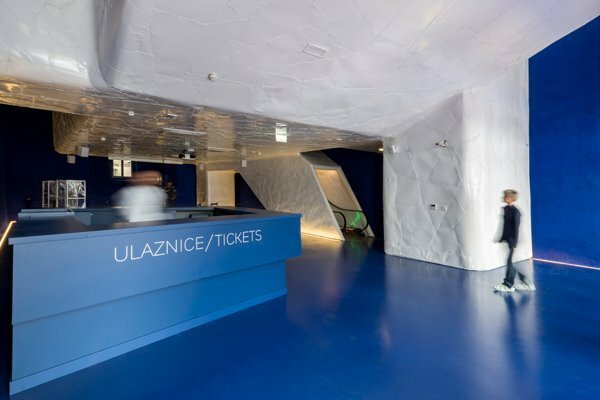 Its metal structure with nine rooms is made of metal pipes and plates, and is plated with pieces of sheet metal that were custom-welded by Lošinj shipbuilders. The welding and white metal are reminiscent of a ship and are thus connected to the island’s maritime history and Apoxyomenos’ voyage, which for unknown reasons ended with its sinking to the bottom of the sea, where it laid for thousands of years. A visit to the museum starts by entering the blue room. The deep blue reminds us of the sea where Apoxyomenos spent thousands of years before being discovered. 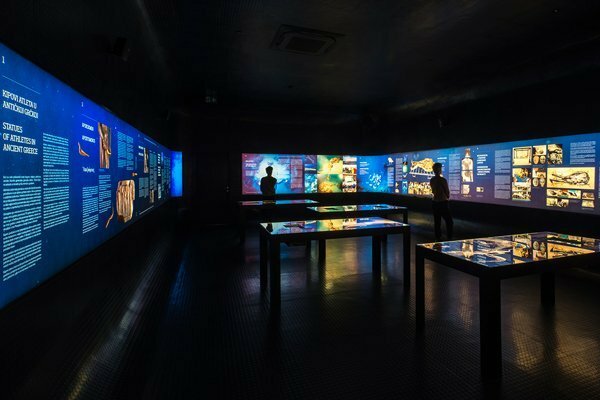 After being taken to the first floor in a dramatic narrow elevator, visitors find themselves in the black room, which is equipped with monitors that tell the story of Apoxyomenos, its history, artistic value, and discovery. Next, there is an impressive room covered in a wonderful carpet with motifs of the sea, sea plants, wheat, and fields, as a nest of a small rodent, twigs and seeds were found in the base of the statue. 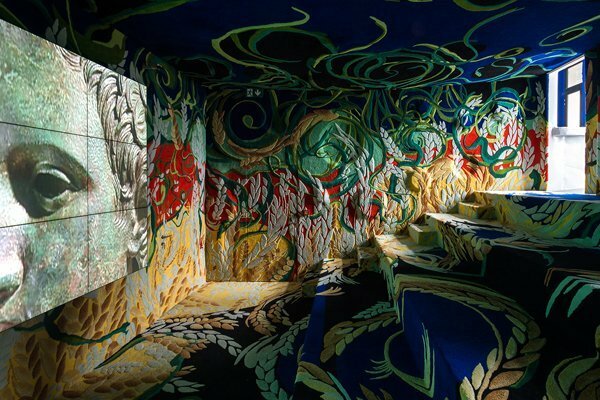 The hand-made carpet, woven in relief and in vivid colours, creates the perfect atmosphere for a short break and an interesting documentary about Apoxyomenos. 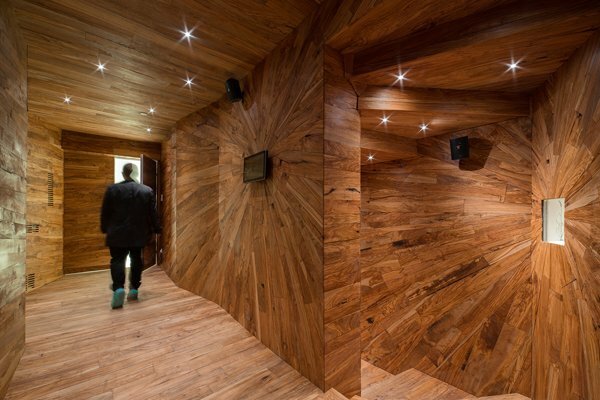 The yellow room is covered with excerpts from newspapers and magazines about Apoxyomenos and the museum, after which visitors pass through a fantastic passage covered with olive wood plates. The textures of the walls tell the story of Apoxyomenos’ Mediterranean homeland, which is characterised by the sea, fields, olive groves, and ships. The most important room, the white one, is the place where we encounter Apoxyomenos himself. The diffused light and complete whiteness provide an intense and contemplative encounter with the magnificent ancient statue. 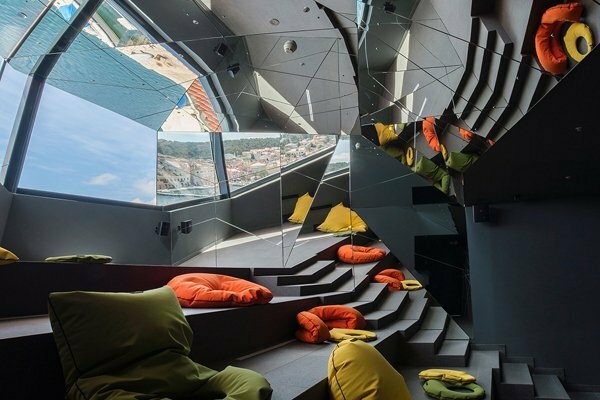 The visit ends in a room whose ceiling features a set of mirrors that reflect the harbour and town of Mali Lošinj. 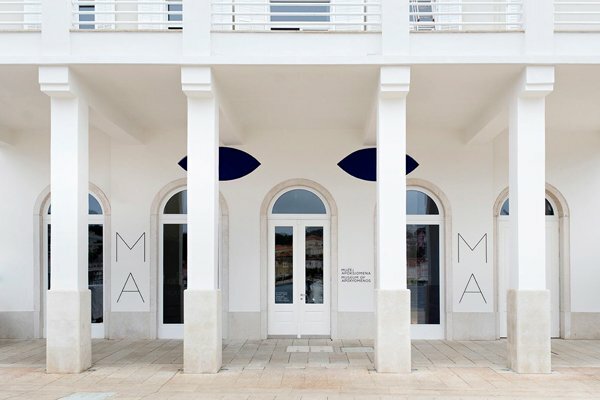 This museum reinforces the image of Lošinj as a place of elegance, vitality, activity holidays, and timeless beauty. Make sure you visit it! Tagged Apoksiomen, Muzej. Bookmark the permalink.